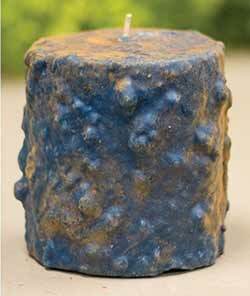 Blueberry Cake Candle is a country blue color, and rubbed with spices. Made from scratch, they have a textured finish not unlike that of a nutty, ripply, iced cake! 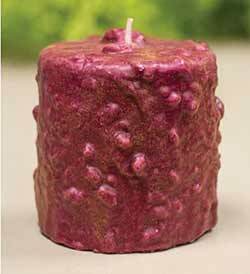 Cranberry Cake Candle is a burgundy color, and rubbed with spices. Made from scratch, they have a textured finish not unlike that of a nutty, ripply, iced cake! Gingerbread Apple Cake Candle is a mustard gold color, and rubbed with spices. Made from scratch, they have a textured finish not unlike that of a nutty, ripply, iced cake!